New England musicians use their power for good when it comes to karma-infused causes. From the This Is New England - A 100% Benefit Compilation allocating proceeds between brain cancer research and The One Fund, to the Boston Does Boston 3 night, 2 CD comp benefiting the Animal Rescue League of Boston, local musicians prove their interests spread beyond cheap beer and record collections. Recently established local DIY label, New England Basement Records out of New Hampshire, jumped into the scene with Catz Bop Vol. 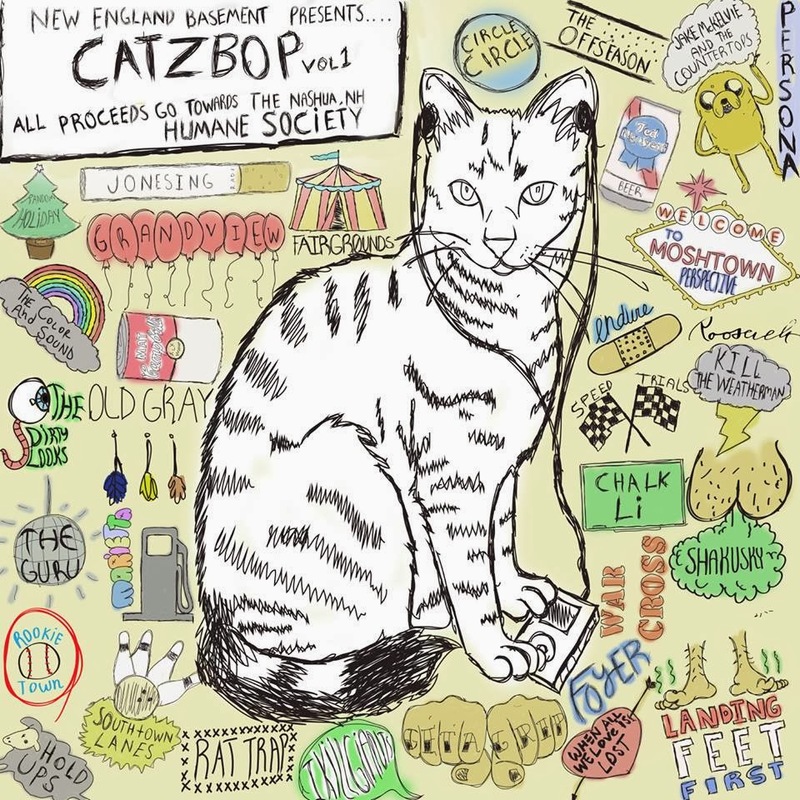 1, a 32-track compilation featuring old colony state artists, benefiting the Humane Society of Nashua New Hampshire. "Our motivation behind starting the compilation was [that it] benefited everyone involved," states New England Basement Records co-founder Ben Walker. Looking to foster the sound of New England music through recording, releasing and promoting the "finest jams", a compilation seemed like the most effective starting point. "We chose the Humane Society because we're all big fans of animals, all of us owning a few, and we've always supported the Humane Society and what they do." I can has compilation donation? Donate today. What started as a passive, inside joke, escalated into a full-blown musical operation when the idea of establishing an audio fundraiser became reality after several bands jumped onboard. "Most of them were bands that were really making an impact in the local scene," explains Walker when describing the selection process that included Old Gray, The Color And Sound, The Dirty Looks and The Off Season. Since its conception in late February, proceeds from Catz Bop Vol. 1 has raised over $120 in download donations for the Human Society. New England Basement Records plans to pass on additional compilation proceeds on a monthly basis. While developments for the next beneficiary project are in the works, Walker states NEB Records will focus on signing new bands to the label for now, adding, "We are a non-profit label, and all money we make will either be circulated to fund further productions or donated." Make a homeless animal's day and grab your copy of Catz Bob Vol. 1 today. Donations start at $3. Give what you can. New England Basement Records is actively looking for new talent. Interested bands can contact them at NewEnglandBasement@gmail.com. Follow NEB Records on Facebook and Twitter upcoming shows, new bands and additional compilations.